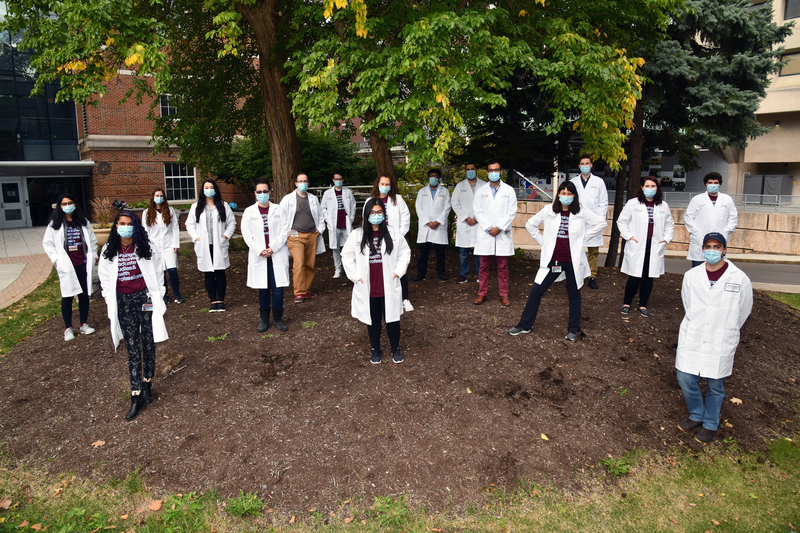 Dr. Mark Schmitt, Dean of the College of Graduate Studies, presented our first year graduate students with their customized, white lab coats at the annual Biomedical Sciences Retreat. The College of Graduate Studies provides you with maximum choice in selecting a research specialization, giving you a full year to choose the topic and mentor for your dissertation research. During that year, you learn about research at SUNY Upstate through faculty presentations and lab rotations, and study a core curriculum designed to give you a broad-based education in the biomedical sciences. Students start taking advanced courses in the spring of their first year and begin work on their dissertation projects at the start of the second year. Our students present their research findings at local, national and international meetings, and publish their work in peer-reviewed scientific journals. "White coats are often seen as the classic dress of physicians, and medical schools around the country, including Upstate, have begun using 'white coat ceremonies' as an initiation into medical school. But indeed these white coats were stolen from scientists. Over 100 years ago, in 1910 Flexner came out with his report that changed physician education. Until that time physicians wore black and were fraught with quackery and mysticism. This is in contrast to scientists who were provided considerable respect and high esteem. In order to emphasize a new form of medicine based on scientific principles, physicians began wearing the white coats of their scientist colleagues. Hence, it is only fitting that we steal that ceremony back from them." Last Modified: December 04, 2017. Contact Jennifer Plencner with questions about the content of this page.